Once I had decided to create Zylarthen (or the original effort that became Zylarthen), one of the most basic questions was which set of monsters to include. I had two goals, and I didn’t initially know whether I could satisfy them both: 1. Make the list such that it would distinguish Zylarthen from the competition, as well as if possible constituting a worthwhile improvement or at least alternative to the standard canonical list. And 2. Be as faithful as possible to the original OD&D monster offerings. The most obvious first pass idea was to include all and only those monsters explained and “statted” in the 1974 Monsters & Treasure. But it was quickly apparent that there were a number of problems with this. First of all, the list is actually quite short compared to what most of us are used to—only 60 creatures long if the subgroups are not counted—and it doesn’t include many of the monsters that we now think of as canonical—Carrion Crawlers, Stirges, Mind Flayers, Shriekers—some of which first appeared in Greyhawk or The Strategic Review. Second, using the original basic list seemed, well, sort of boring and had been done by at least one of the other clones. What exactly would be the point of rewriting the blubs for the 100 odd original creatures and setting out the same stats? Granted, one might be able to make some of the information a bit clearer than the original, but one would in turn lose some of the brilliant Gygaxian turns of phrase. What would be the purpose of a Zylarthen monster book, other than just to, well, have such a book with the “Zylarthen” label on it to go with the game? The next thing that came to mind was to include all the monsters from Monsters & Treasure, The Strategic Review and the three (or possibly four, if one includes Gods, Demi-Gods and Heroes) supplements. This would in effect have created simply a leaner OD&D version of the Monster Manual. That’s actually the primary reason I rejected it. Plus there were many monsters that seemed inappropriate to include in a small booklet, such as the numerous aquatic offerings of Blackmoor. It just seemed counter to the tone of the game to include the full parade of those watery creatures. For a month or so I toyed with the idea of including every creature mentioned in the above sources, including all of the unstatted animals (giant and otherwise) in the wilderness encounter tables at the back of Eldritch Wizardry. I even started to research these animals so that their blurbs would be more “realistic”. (Do Jaguars generally live alone? How many cubs do they have?). It’s true that this would have created something a bit different from the Monster Manual, but its distinguishing feature would have been that 50% of it would be extremely boring. Fortunately I saw the light and scrapped that idea. Well, why not just take the monsters I liked from OD&D and leave out the boring or silly ones, you ask? Swords & Wizardry basically does this, to give one example. The answer is that I guess it just offended my sense of historical symmetry. I wanted my effort to be in certain ways hyper-faithful to the original game, and so just picking and choosing seemed arbitrary to me—“house-ruley” as opposed to historically grounded. I expanded on the implicit potential of “Flyers” in The Underworld and Wilderness Adventures—adding such giant flying bugs as Bumblebees, Moths and Locusts (the “sexist” comment in the description of one of those creatures was meant in fun and to see whether anyone was listening)—as well as adding what I called “True Wraiths” from Chainmail. One of the most noticeable features of Zylarthen was the substitution of player-character Thieves for Clerics. This was not merely because I subjectively didn’t like Clerics but because I thought having Clerics as player-characters was inconsistent with the overall tone of OD&D. But they very much remain as important "monsters". Among other things, one may encounter Evil Priests who employ the Finger of Death. Also consistent (in my mind) was adding a collection of gods (without stats) side by side with the other creatures. Not to seem too full of myself but it seemed to me that OD&D should have done this (and not by giving them stats in a separate supplement). Having a diversity of gods ready to occasionally interact with humans was implicit in the setting, I think. Interestingly, even though the gods only occupy a few pages, every reviewer has mentioned them. I didn’t expect this, as including them was almost an afterthought—but it was a choice I am increasingly very satisfied with. Coming up with “alternative” level names, especially for evil non-player characters was fun. In my view, that was one of the really neat things about original OD&D. Who wouldn’t rather see “Thaumaturgists” or “Swashbucklers” in a random monster table than “5th level Fighters” or “5th level Magic-Users”? As much as I respect Gygax, I thought some of the original level titles were slightly silly and random—Vicars?—but the idea was cool. The online OED as well as some other dictionaries and etymologies were quite helpful in my efforts. The “restriction” of not copying most of the level titles (partly for legal reasons) actually ended up being quite liberating. The guiding philosophy was not to subjectively add things but to be faithful to the spirit if not the (sometimes neglected) letter of the original. I hope I succeeded. What’s old can be new again! An Iron Golem, drawn by John D. Batten, 78 years before the publication of Monsters & Treasure, in Book of Monsters, p. 32. 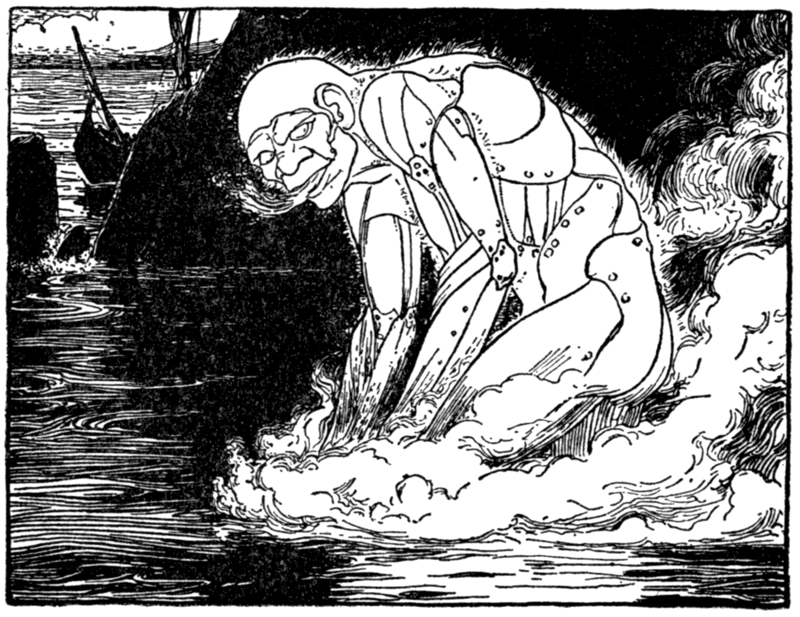 From The Beguiling of Talus, from “The Argonauts,” in Jacobs, Joseph, The Book of Wonder Voyages, New York: Knickerbocker Press, 1919, orig. 1896, p. 84. An Invisible Stalker in the act of, well, stalking, in Book of Monsters, p. 35. 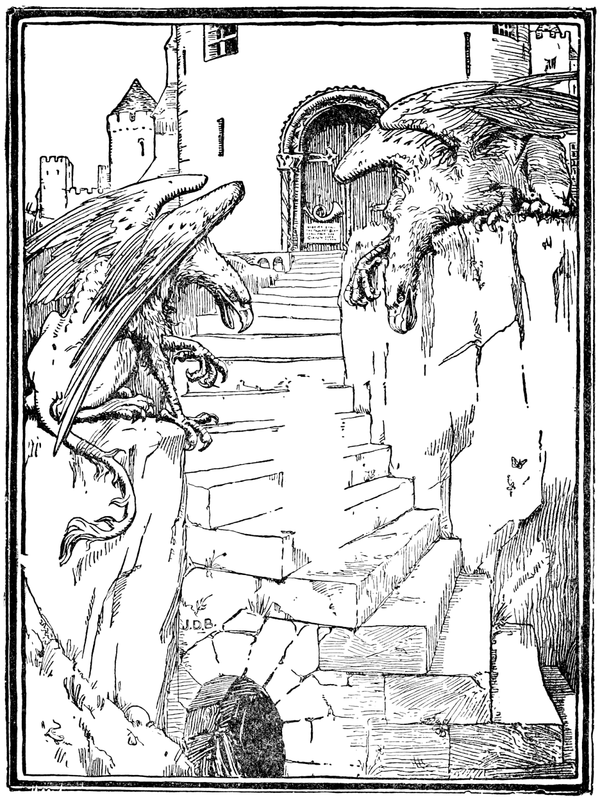 From Jack With His Invisible Coat, from “Jack the Giant Killer,” in Jacobs, Joseph, English Fairy Tales, illustrated by John Dickson Batten, New York: G.P. Putnam’s Sons, 1892, orig. 1890, p. 117. A Unicorn "staying in shape", in Book of Monsters, p. 59. 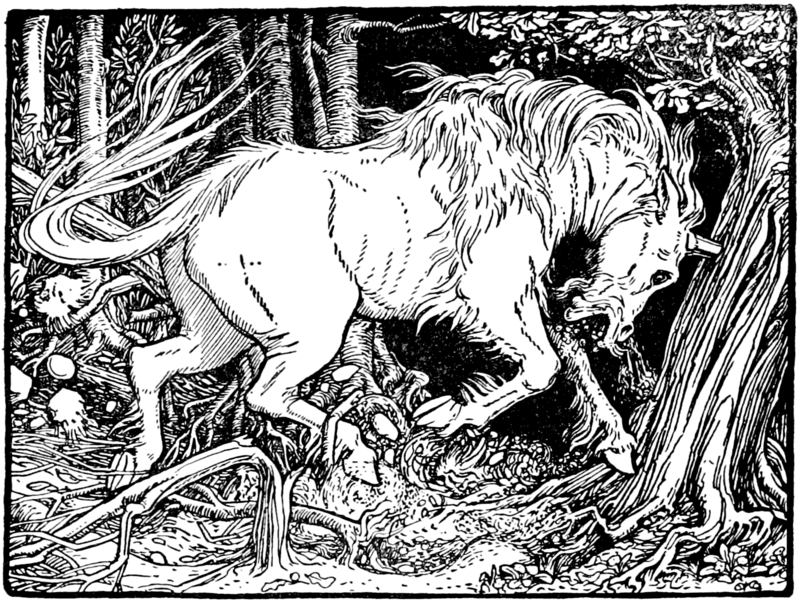 From The Unicorn, from “A Dozen at a Blow,” in Jacobs, Joseph, Europa’s Fairy Book, by Joseph Jacobs, illustrated by John Dickson Batten, New York: Knickerbocker Press, 1916, p. 81. 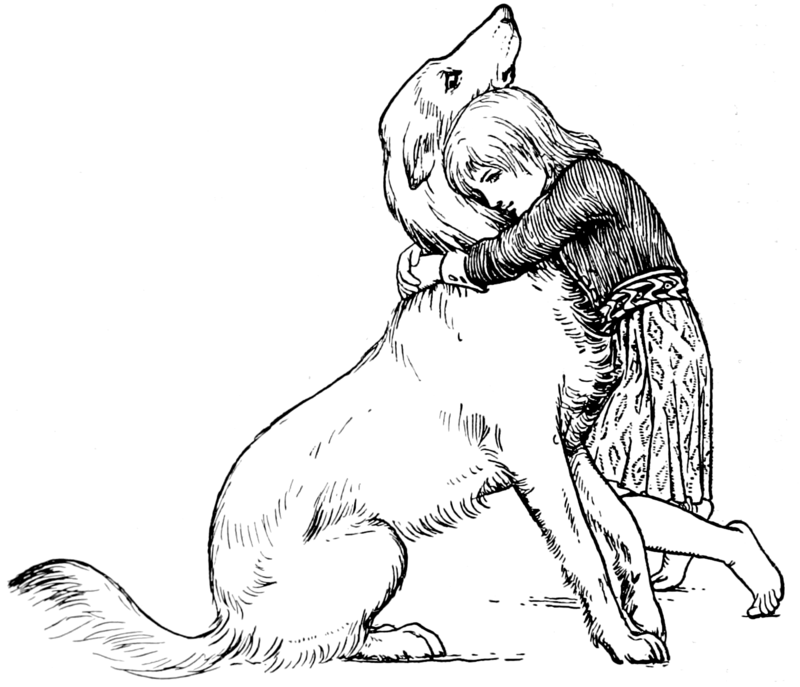 A boy hugging a dog. I thought it appropriate to end the Book of Monsters on a positive note (p. 64). From ”Morraha,” in More Celtic Fairy Tales, p. 92. Interesting approach. It is interesting how many monsters are mentioned but never detailed. And I really like the iron golem illustration. I like the ranges of monsters and men as presented in Seven Voyages. Cheirosiphoneer- hand fighters? Pugalists? Wrestlers? Please mentally edit my initial comment above to read " ... but never detailed in the OD&D booklets." Sorry about that! At any rate, I've d/l your free PDFs from Lulu and I'm looking forward to reading through them. Thanks, Cameron. That raises a question. Does anyone know whether there's something I can twiddle so that people can edit their comments? Cheirosiphoneer: likely someone who dug trenches in order to get the cheiroballista and other siege engines closer to an enemy fortification. A sapper. Late Roman era. Well, if you google "Cheirosiphoneer", the only thing you get is this very blog post, so the above may be the very first use of that word on the internets. In other words, don't kill me if it turns out that the precise term was first coined by me. :) But a cheirosiphon was a hand-held siphon for spraying Greek Fire--sort of a primitive (but very sophisticated for its time) flame-thrower. So just as a javelin thrower is a javelineer, a cheirosiphon user might be called a cheirosiphoneer (or so it seemed to me at the time of writing, and I did think it a rather neat archaic sounding term that would hopefully intrigue Zylarthen readers). Apologies if it was sort of a trick question, but to be honest, I'd forgotten the precise genesis (my own extrapolation) of the "-eer" part. makes sense,I had " hand tube user "in my head but couldn't make it fit an ancient weapon, of course the detail curious gamer in me thinks "What would the stats for the Cheirosiphon" be? Me I'd have them hit with the same to hit roll as a thrown axe with the range of a light crossbow, inflciting normal 1d6 damage with the target allowed a save or be engulfed in flames for an extra 1d6 damage for the following 2 combat turns.